Last fall we drove out of the city for a foliage-bedecked long weekend getaway in the Berkshires with our friends and their adorable Westie. Along with a healthy supply of alcohol and board games, our friends brought the cookbook Jerusalem. Cooking was a focus since we had been hyping up the charcoal grill and smoker we were going to be able to use, two cooking apparatuses generally frowned upon in New York City. Along with our grilled steak, we adapted an eggplant recipe from the cookbook, charring halved bulbs over the coals until they rivaled the smoky meat. We've recreated a version that's apartment-friendly so that even sad urbanites with no outdoor living can enjoy the char of caramelized eggplant skin paired with fresh bursts of lemon pulp and mint leaves, along with some ingredients, like za'atar spice, that are not available in the Berkshires. While we had this with our crispy chicken thighs and are dying to have it with roast lamb, it's substantial enough to enjoy as a main course. 1. Heat oven to 500 degrees. Lightly score flesh of eggplant in a cross-hatch pattern. Season eggplant flesh with 3/4 teaspoon salt and 1 teaspoon za’atar. Drizzle flesh with two tablespoons oil. Arrange eggplants flesh side-up on a rack set up inside a parchment-lined rimmed baking sheet. Bake until soft and very well browned with some char, ~20-30 minutes. 2. Meanwhile, stir together lemon flesh and juice, 1 clove garlic, half of chili pepper, 1/2 teaspoon za’atar, 1/4 teaspoon salt, and 1 tablespoon oil in a small bowl. Set aside. 3. Heat remaining tablespoon oil in heavy-bottomed skillet until smoking. Add onions and remaining 1/4 teaspoon salt. Cook, stirring occasionally, until soft and very well browned, ~5 minutes. Add remaining 1 clove garlic, remaining 1/2 chili, and remaining 1/2 teaspoon za’atar. Cook until fragrant, ~30 seconds. Remove from heat. 4. 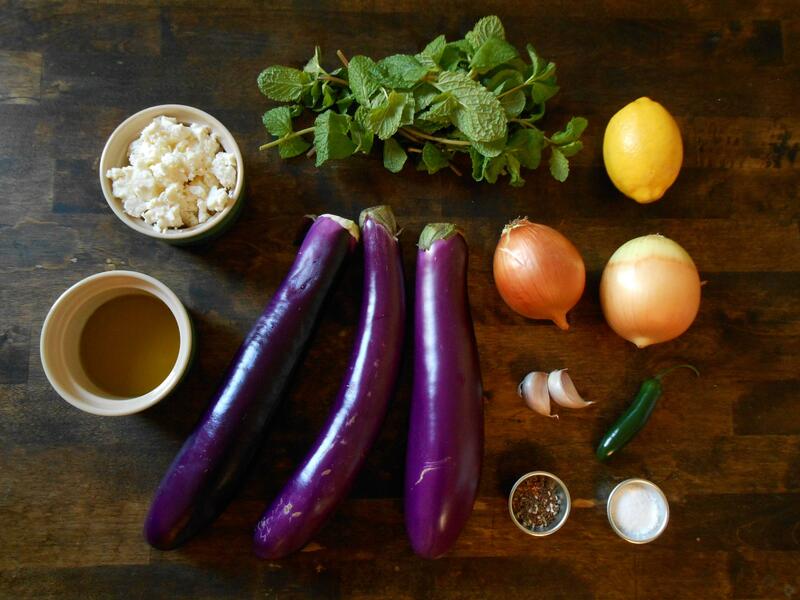 Top eggplants with onions, lemon sauce, and feta. Garnish with mint and serve immediately or at room temperature. This dish might be more accurately called "spices we happened to have around one day" chicken. We usually don't keep curry powder or Garam Masala on hand, so we mixed together our own vaguely Indian spice blend for this smoky, spicy chicken dish that will definitely remind you of tandoori chicken. Feel free to adjust the spices somewhat, but be sure to use lots of cumin, which is the central flavor. We don't have a grill, but we can pretend we do when we get meat so nicely charred and tender by using the broiler. Just be sure to use a broiler pan, which will allow fat to drain without smoking up your apartment (and maybe crack a window anyway and/or throw a damp towel over your smoke detector just to be safe). *We don't usually call for specific brands, but differences in the size of the salt crystals used by different brands affect how salty the brine will be. If using Morton's kosher salt, use 3/4 the amount called for in the recipe. If using table salt or fine sea salt, use 1/2 the amount called for in the recipe. 1. Dissolve 1/2 cup salt in 8 cups cool water in a large mixing bowl. Submerge chicken and cover bowl tightly with plastic wrap. Let stand at room temperature for 30-45 minutes, or refrigerate for 2-3 hours. Do not leave in the brine too long, or the chicken will be too salty. Drain chicken, rinse with cold water, and pat dry with paper towels. 2. Meanwhile, soak 8 bamboo skewers in warm water for at least 20 minutes. 3. Stir together yogurt, cinnamon, cumin, cayenne, red pepper flakes, paprika, garlic powder, marjoram, black pepper, baking powder, canola oil, and remaining 1/2 teaspoon salt in large mixing bowl. Add chicken to bowl and coat evenly with yogurt mixture. 4. Fold one chicken thigh in half, smooth side out, and thread onto two skewers spaced about 1 inch apart. Thread two more thighs onto the pair of skewers. Repeat with remaining thighs to make four double skewers, each with three chicken thighs. (If this is at all confusing, just look at the picture.) Let rest on a plate at room temperature for 20 minutes. 6. 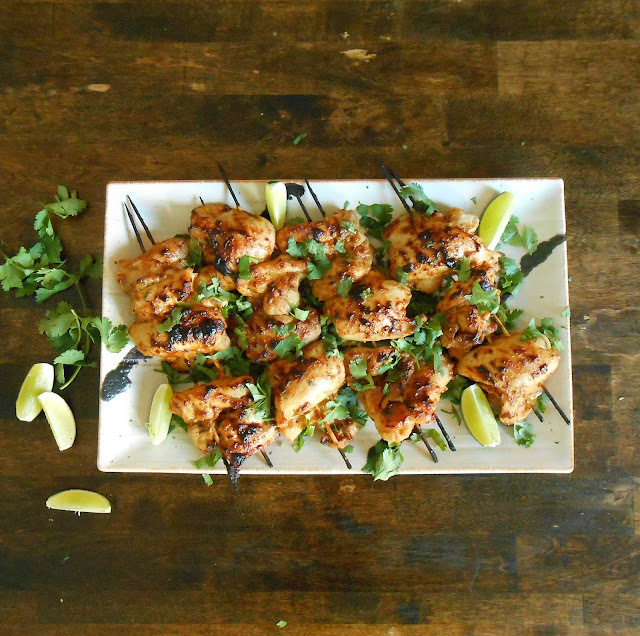 Place chicken skewers on a broiler pan and slide under the broiler. Cook, flipping skewers or rotating pan every 2-4 minutes to ensure even browning, until cooked through, well-browned, and lightly charred, about 20 minutes. Adjust the placement of your pan if necessary; for example, the last time we made this, we cooked the chicken about 2 inches under the broiler for 18 minutes, and then moved the broiler pan about 1 inch closer to the broiler to finish browning for another 4 minutes. Exact cooking time and pan placement will depend on your broiler and you will have to play it by ear. 7. Sprinkle with cilantro and serve with lime wedges on the side. When we moved to Prospect-Lefferts Gardens a few months ago, we were pleasantly surprised to learn about Parkside Greenmarket, a small but high-quality farmer's market by the Parkside Q stop. American Seafood, a small stand selling wild-caught fish and shellfish from Suffolk County, NY, has an excellent variety of seafood (blowfish tails, anyone? 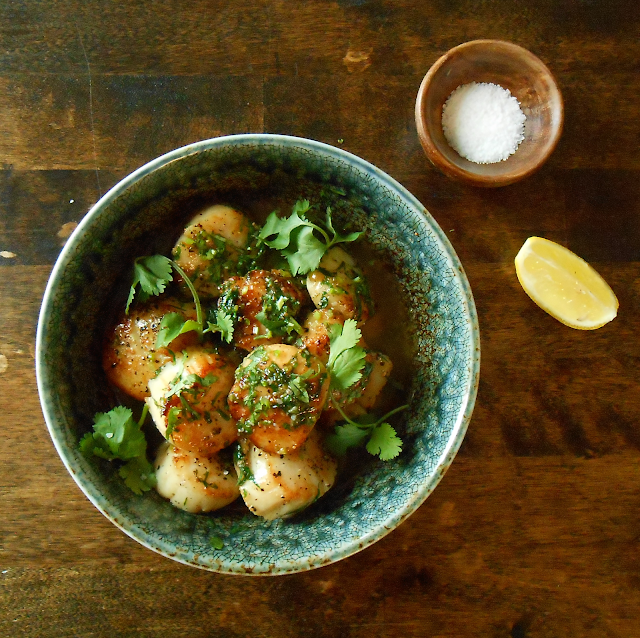 ), but we always buy at least a few sea scallops for a Sunday-evening treat. There's not much to say about the cooking method. Sear the scallops on one side, add some butter, flip, baste, and pull them while they're still medium-rare. Don't futz around with the seasoning. Lemon, fresh herbs, a little pepper, and some crusty bread to mop up the sauce. 1. Season scallops on both sides with salt. Heat oil in skillet over high heat. When oil starts to smoke, add scallops in a single layer. Sear until first side has formed a golden-brown crust, about 2 minutes. 2. Drain off excess oil from pan (a great method is to tilt the pan so the oil pools in one spot, and then sop it up with a wadded-up paper towel held in a pair of tongs). Add butter and reduce heat to medium. Flip scallops with offset spatula, tilt pan, and baste scallops until butter begins to turn brown and nutty, about 1 minute. Stir in lemon juice and cilantro. Season with pepper and serve immediately. This dish is a nice segue from summer to fall, incorporating late-summer vegetables into a meal hearty enough for a chilly evening. Chicken sausage keeps things more lo-cal than bacon or chorizo (both would be great, by the way), though we balance that out somewhat by adding some of the flavorful oil from the anchovies and sundried tomatoes. 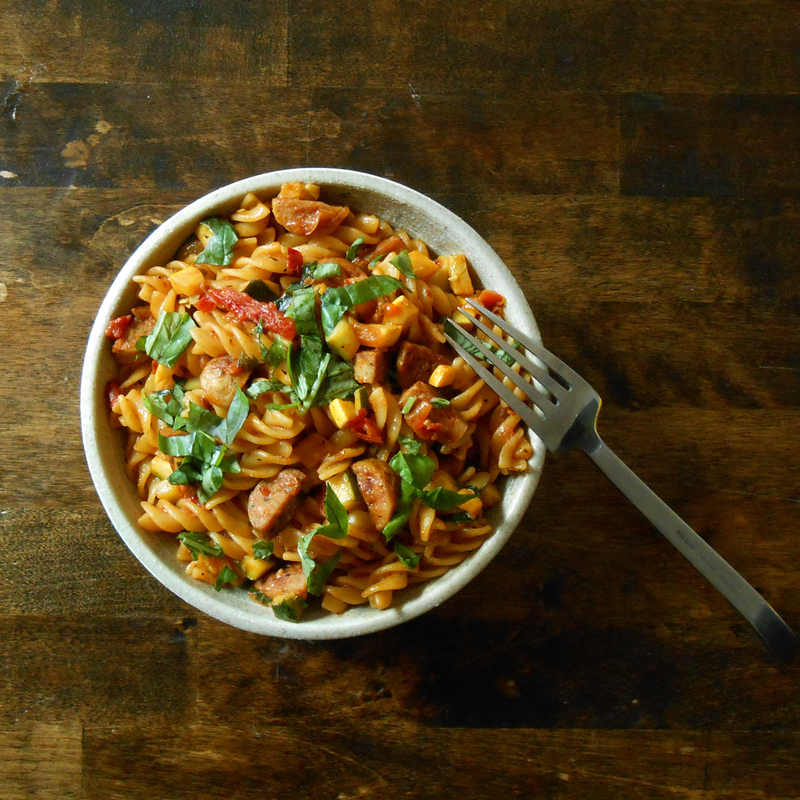 Perhaps because the summer squash has such a firm texture with this cooking method, a bowlful of this pasta goes further than usual (one helping each is plenty for us, which is not typical). Leftovers will be great at room temperature the next day. 1. Toss squash with 1 teaspoon salt. Transfer to colander to allow excess liquid to drain while you prepare the rest of the sauce. 2. Heat oil in skillet over medium heat. Add sausage and sauté until well browned, about 7 minutes. 3. Add onion, anchovies, and anchovy oil to skillet. Cook, stirring occasionally, until soft and translucent, about 6 minutes. Add garlic and red pepper flakes and sauté until aromatic, about 30 seconds. Add tomato paste and sauté until lightly caramelized, about 1 minute. 4. Add drained salted squash and sundried tomatoes and stir. Sauté until all ingredients are incorporated and squash is just beginning to soften, about 1 minute. Add a splash of water, stir to deglaze pan, and continue to cook until squash is just cooked (it should still have some bite to it) and liquid has thickened, about 3 minutes. 5. Meanwhile, cook pasta in boiling salted water until just shy of al dente, about 7 minutes. Drain, reserving a few tablespoons of pasta water. 6. Add pasta and reserved pasta water to sauce. Stir, reduce heat to medium low, and cook, stirring occasionally, until pasta has absorbed sauce and texture is al dente, about 1 minute. Remove from heat and stir in lemon juice and basil. Season with a little pepper, and then taste and adjust seasoning with salt and pepper as necessary. Serve immediately, garnished with reserved basil. Mimi's Hummus in Ditmas Park, a neighborhood just south of us, has some of the best Mediterranean food we've ever had. On our first visit, we ordered an amazing dish called "meat hummus," which featured their insanely smooth and creamy hummus topped with a spiced ground beef mixture (now departed from the menu, sadly). We decided to refashion the meat into a lettuce wrap filling since recreating their hummus would take an enormous amount of skill and work. The tahini sauce we pair with the lettuce wraps is a little finicky; be sure to fold the ingredients together very gently to prevent it from seizing up. Even if you're careful, you will probably end up with a thick, slightly grainy texture, rather than a completely smooth and pourable sauce--and that's just fine. The leftover sauce makes a perfect dip for sliced cucumbers and radishes. 1. To make sauce, gently fold together tahini, lemon juice, chili oil, and honey. Season lightly with salt and pepper. 2. Heat canola oil in skillet on medium high. Add ground beef and season lightly with salt. Cook, stirring occasionally, until evenly browned, about 10 minutes. Remove from heat and transfer to bowl with slotted spoon. 3. Drain fat from skillet, leaving just enough to coat the bottom. Add onion, season very lightly with salt, and sauté on medium-low heat, stirring occasionally, until soft and golden in color, about 15 minutes (deglaze pan with a splash of water as necessary if it gets too dry). Stir in garlic, cayenne, cinnamon, cloves, and marjoram. Sauté until aromatic, about 1 minute. 4. Add beef to onion mixture and cook just until heated through, about 1 minute. Remove from heat and stir in pine nuts and a big pinch of parsley. Taste and adjust seasoning with salt and pepper. 5. To make lettuce wraps, place a heaping tablespoon of beef mixture in the center of each lettuce leaf. Top with tahini sauce to taste and sprinkle with more parsley.